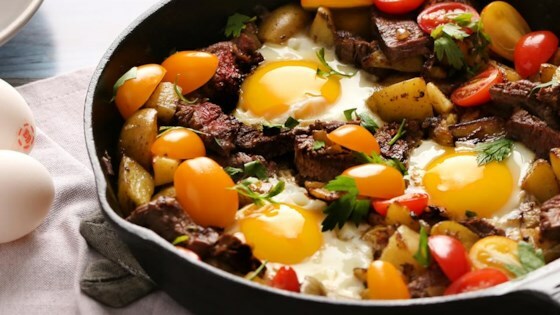 "Pan-fried potatoes and onions are topped with eggs, cherry tomato halves, and sliced steak for a hearty breakfast--or dinner!" Cook the steak in the cast iron skillet over medium heat, flipping half way through until entirely cooked through. Remove to a plate and reserve the drippings in the skillet. Add the potatoes to the skillet and season with salt and pepper. Cook, stirring occasionally, until tender, (8 to 12 minutes). Add the onion and cook until lightly browned and the potatoes are cooked through, (3 to 5 minutes). Cut steak into pieces and return to skillet, reduce the heat to low. Make 4 shallow wells in the potato mixture and crack an egg into each one. Season the eggs with salt and pepper, sprinkle with Italian Seasoning, and enjoy! A comforting breakfast packed with flavor! I added in some diced bell pepper and a few sliced Baby Bella mushrooms. We loved it! Great easy recipe, my husband loved it! Family favorite! I typically make this dish using left over steaks and smashed potatoes! Easy peasy, and delicious! Awesome recipe and fairly healthy too.